The bright red words scrolling across the electronic Fox News ticker in New York City high above Mandy Helton Jones demand immediate attention: The Dow is up 102.27 (for the moment). Barack Obama allegedly lamented some years ago that the Supreme Court hadn't ventured into wealth redistribution. Sarah Palin warns that Democrats want to "punish hard work." But the cheery twentysomething Evangelical with red hair and a discreet nose stud is concerned with more timeless words. To a middle-aged gentleman wearing a fleece vest bearing the insignia "Peking University 1898," she is explaining, "I've got a verse for you right here. It's next one up in [the Book of] Numbers. So what you've gotta do is write '29' for the verse. And then print everything that's on this card." She hands him an index card with the Biblical verse, warning, "No cursive, and stay inside these lines. The person before you indented a little bit too much, so you can start all the way back here." The man begins to write. Jones is an employee of the year's most creative Bible promotion. 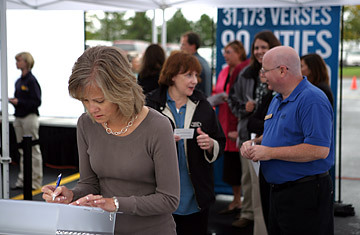 To celebrate the 30th anniversary of the hugely popular New International Version (NIV) of the holy book, Zondervan, the religious publishing company owned  like Fox television  by News Corp., is sending Jones, her husband Jon and another couple around the country in a 43-foot-long donated blue RV, to supervise the handwritten copying of the NIV's 31,173 verses, one verse at a time, by believers in 44 states. Finished facsimiles will be in bookstores late next year. "The power of the Bible written by the human hand has been lost since the introduction of the printing press," says Lori Anne Ferrel, author of The Bible and the People, to be published by Yale University Press in December. "This brings it back, but as the effort by thousands of people instead of one monk laboring in a scriptorium." The result, she says will be "almost homey, as if it were stitched onto a sampler." At least the monk in the scriptorium was spared the trials of life in an RV. Three weeks into its odyssey, the big blue bus broke down outside of Hartford, Conn. While waiting for parts to be flown in from the manufacturer, Jones and her companions are having to attract attention by sitting at two white tables under a modest white tent on 48th Street in midtown Manhattan. The ticker above them is flashier than the tent. A deluxe halal food cart across the street is nearly as large. Two ladies seat themselves on a bench a few feet away and commence a spirited, non-Biblical conversation in Russian. Still, the Bible team is undeterred. "Hello, my dear," says Brooke Paneitz to Maurice Pusey, a chef at a nearby fish restaurant. "You get to start a new chapter." She gives Pusey Deuteronomy 5: 1  "Moses summoned all Israel and said: Hear, O Israel, the decrees and laws I declare in your hearing today. Learn them and be sure to follow them." Pusey, a 41-year-old English immigrant, copies it twice  because Zondervan is actually making two master editions  in careful block capitals. He was originally drawn to the tent, which says BIBLEACROSSAMERICA.COM on its back and WRITE NOW on its sides, because he thought he could buy a new Bible; some pages of his own got stuck together in his knapsack. But he loves the project. "The idea of writing it out again with other Christian believers is a great thing," he explains. Pusey's father died over the summer, and "I really do need faith to keep myself going," he says. He reads the Good Book daily, but sees his assigned verse as a gentle reminder to stop wandering around in the swashbuckling books of Kings and return to reading the four Gospels. Up strolls Dino Diano, an auditor for the California Franchise Tax Board. Diano, 32, was raised Catholic but is now a nondenominational Protestant, attending a Baptist church, a Christian tabernacle and even a couple of Messianic Jewish congregations (to show solidarity). He opens the Bible at random each morning. "If you start to think too much, you start missing the point of what it's about," he says. The verse he draws is Numbers 16: 21: "Separate yourselves from this assembly so I can put an end to them at once." God is clearly angry. Diano won't speculate on the verse's application, but ventures that the current market turmoil is "not that God is punishing us, but he's letting things go their normal course without helping us." Too many people here and elsewhere idolize wealth, he says, and he hopes the financial crisis will "plant a seed in people's heads and more of them might start reading the Bible and turn to God." Craig Thompson gets Deuteronomy 5: 8: "You shall not make for yourself an idol in the form of anything in heaven above or one the earth beneath or in the waters below." "It was tremendous," he says when he finishes copying. "I felt like an old-time monk." Thompson, who is from Miami, admits he prefers the New American Standard version to the NIV, but translation notwithstanding, "the principle is there. God can't lie, and he can't be inconsistent." Then the 35-year-old construction consultant takes his leave. "I'm just visiting New York doing a little campaigning," he explains. "I'm a write-in candidate for President of the United States." At 6 p.m., the Zondervan Four strike their tent. It has not been a banner day. Their best haul in a day so far has been 543 verses, at Jerry Falwell's Liberty University. Today, Jones estimates, "we got 45, maybe 50." But without the drawing power of their bus, they had low expectations  and the day's tally was boosted by the participation of members of a group from Australia that produces worship songs. Today's verses included one of the Old Testament's listings of the Ten Commandments; a girl writing out "honor your mother and father" had to choke back tears. The four sojourners are due next in Philadelphia. And then, God and the mechanic willing, they will reunite with the big blue RV and roll onward to Washington, D.C., and beyond, following Jesus' instruction, in Matthew Chapter 28, verses 19 and 20, that the NIV translates as: "Therefore go and make disciples of all nations ... teaching them to obey everything I have commanded you. And surely I am with you always, to the very end of the age."